Brwygaid is a low-population world with a population of less than 10,000 sophonts in size. A system in Gimgir subsector. The whole of the mainworld is an archaeological artefact - it is an entire world massively terraformed by the Ancients. The system primary is Brwyg, an ordinary red main sequence star. It retains a family of eight worlds: (I) Brwygaid is designated the mainworld and orbits closely enough to the star to qualify as occupying the habitable zone. (II) is an empty orbit, reckoned to be the original position of (I) Brwygaid. The system also contains a sparse stony planetoid belt (III; evidence suggests that it was formed around 300,000 years ago - it may be the remains of a world destroyed during the Ancient Final War), one large gas giant world (IV), two small rocky worlds (V, VI), two small gas giants (VII, VIII), and an outer large icy planet with an exotic atmosphere (IX, a "failed gas giant"). All of the gas giants and the outer icy planet retain families of satellites. The repositioning of Brwygaid from orbit (II) to orbit (I) was a part of the terraforming carried out by the Ancients. (I) Brwygaid orbits Brwyg at a mean distance of 0.03 AU and has an orbital period of 72.5 standard hours: it is tidally locked to the star, though it "rocks" as it orbits giving a sun-up / sun-down cycle of 32.2 hours at the equator and tropical latitudes. It has a diameter of 8,050 km, a density of 4.65g/cm³ and a surface gravity of 0.53 G. It retains a nitrogen-oxygen atmosphere rated as standard with a mean surface pressure of 0.53 bar: the oxygen content of the atmosphere is 24%, slightly higher than average. Approximately 71% of the surface is covered in oceans of liquid water: the regular rocking motion of Brwygaid and the powerful gravitational influence of Brwyg causes tidal ranges in excess of 20m. Brwygaid has an active hot iron core and has an extremely strong magnetosphere, powerful enough to protect it from the intense radiation given off by Brwyg. Research carried out under the aegis of the Scout Service has shown that the core of the world contains a high percentage of artificial elements that can only have been placed there by design. These serve to massively increase the size and strength of the worlds natural magnetic fields. The entire sky of Brwygaid is filled with spectacular aurora. Much of the surface is covered in deep oceans of saline liquid water. The northern (bright) oceans are hot and are characterised by dense fogs and steams and intense rains. The southern (dark) oceans are capped by thick ice anchored to a southern polar continent. Strong currents circulate the waters and help to drive weather patterns. Three large mountainous continents straddle the equator and subcontinental islands and long archipelagos lie within the tropics. To human and Vargr eyes Brwygaid is a twilit world of opaque darkness and inky shadows, poorly illuminated at best by the pitifully weak red glow of Brwyg and the soft radiance of the aurora. The climate of the planet is rated as temperate and the mean global temperature is considered to be a pleasant 15°C. Temperatures can exceed 45°C at the northern (bright) pole and can drop to as low as -90°C over central parts of the southern (dark) pole. Weather patterns are cyclic and generally predictable, though occasionly large storm cells may form. Brwygaid has a complex, extensive and thriving ecosystem. All of the lifeforms on the world (and to date over 1.5 million different species and genera have been cataglogued) appear to have been introduced around 300,000 years ago. Prior to that, the world was cold, sterile and barren. Genetic markers indicate that all of the lifeforms were specifically designed using a limited number of baseline primal forms rather than being transplanted from some other world, though some appear to have become specialized through normal evolutionary processes. Organisms range from microscopic to massing many tons. All flora on Brwygiad is characterized by black foliage able to photosynthesize using infrared light. Point Producers (equivalent to trees and shrubs) are prolific and can grow to great heights - trees exceeding hundreds of meters are relatively common. Many trees produce clusters of flowers that give off a soft glow in visible (RGB) wavelengths. No fauna on the world are sensitive to the light produced. Much of the fauna present on Brwygiad is bilateral and follows the general body pattern HBS-T-LN-LL-T, with a cartilage interior support structure, ichor fluids, and a leathery skin. There are many marine creatures, some of tremendous size, and many forms of fliers. The eyes of local creatures are adapted to the local light levels, typically functioning within the infrared (FIN) spectrum. 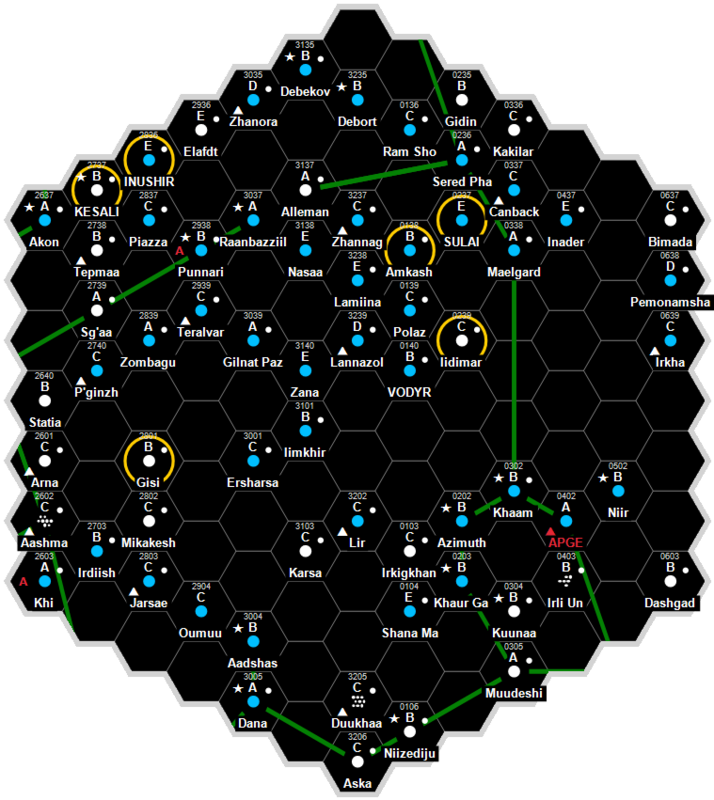 Brwygaid is a low-population Imperial restricted access world, located in Gimgir Subsector of Antares Sector. Brwygaid does not have a starport. Brwygaid possesses a Technology Level of TL–7. Brwygaid has a Participatory Democracy government. This planet has been established as a Red Zone. This is intended to mislead and deceive the general public as to the true nature of operations on this world. The 156th Fleet is used to interdict this world and prevent outsiders from discovering its secret. Around 50 are humans, mostly naval personnel on detached duty from the Imperial 156th Fleet. They occupy a fortified compound on the upper slopes of an active volcano in the northern tropics. The center of the compound contains high-tech fusion tunneling equipment. Around 650 are a militaristic, isolationist community of Vargr. They occupy a settlement in a broad and forested river valley in the northern tropics, within the temperate zone. They practice a crude form of democracy, occasionally holding secretive "long parliaments" to settle outstanding quarrels and issues. ca -300,000 Brwygaid's orbital position is shifted from 0.2 AU to 0.03 AU. The world's hot iron core is modified by the introduction of artifical elements at the same time. ca -300,000 Engineered lifeforms are established on the world, quickly forming a stable ecosystem. ca -300,000 A world located at 0.4 AU is destroyed, creating a planetoid belt within that orbital position. This page was last modified on 11 December 2018, at 18:37.